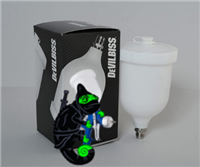 The DeVILBISS GPi activator gun replacement cup. Large 1 pint capacity is a direct replacement for your broken or lost GPi cup. The DeVILBISS GPi activator gun is the next level in the Hydrographics application industry. Exclusive to K2 Concepts in the US, the GPi activator gun package was developed after months of working alongside some of the best in the business. While most spray guns are designed to spray paint, which is much thicker than activator, this gun package was put together exclusively for activator application. The result is the perfect gun and tip set up for the perfect hit...every time. The gun comes set up and ready to shoot right out of the box with the 1.4 needle and tip combination installed.